You can NOT get stuck in Hypnosis. It is very enjoyable to be in Hypnosis and sometimes people chose to linger in that state but it is always a choice. The worst that can happen is that someone passes from a state of hypnosis to that of sleep. They will then wake up naturally. Find out more by downloading the free eBook Improve Your Health & Achieve Success with Hypnosis Now. 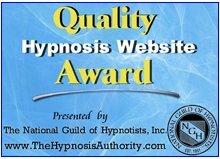 Start improving your life now by joining the 4 Step Self Hypnosis Challenge here!